Edible vegetable arrangements create a beautiful touch on any buffet table. Ranging from the simple to the complex, many can be made using basic kitchen equipment, or you can invest in special tools to create intricate vegetable and fruit 'portraits'. Artistic presentation of food isn't a new phenomenon. Since Roman and Greek times, and possibily even in ancient Egypt, the wealthy enjoyed sumptuous banquets where fruits, vegetables and other foods were carved or prepared in intricate shapes. It's as if people have been fascinated with shaped foods as long as gourmet cooking has been around. Edible vegetable arrangements make great appetizers or hors d'oeuvres. Always use the freshest ingredients you can find. Look for produce that is unblemished. Rinse the lettuce leaves and pick the largest, prettiest ones. Arrange them on the bottom of the decorative platter with the frilly edges facing out so that the entire platter is covered. Next, remove the core of the cabbage or lettuce by hitting the core-side of the head down hard on the counter top. The core should be loose now and you can remove it with your fingers. Peel away the outer leaves if they're damaged until you have a nice, round, symmetrical head. Use your knife to cut a flat side onto the head of lettuce. Make the cut on the side where you removed the core so the hollow spot is hidden. Peel and wash the carrots and cut them into pieces about 3 or 4 inches long. Try to be as neat as you can and cut them into equal lengths. Wash and cut celery in the same or different lengths. Peel the cucumber. Cut it into cubes of the desired size. You can also cut it into sticks like the carrot and celery. Now it's time to get artistic and make your edible vegetable arrangement! Place the head of lettuce or cabbage down on the lettuce-covered platter with the flat side (core removed side) on the plate. 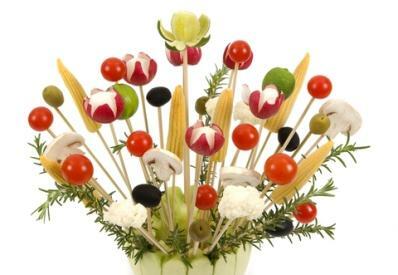 Using toothpicks, stick each vegetable piece you've shaped as well as some cherry tomatoes with the tooth picks. Then simply stick them into the head of lettuce or cabbage, creating whatever pattern you desire. You can also include some pieces of cheese for added interest. Edible Crafts has wonderful ideas for fruit and vegetable arrangements for fancy parties, birthday parties, bridal and baby showers, and more. Pictures show you what the finished centerpiece should look like. Recipe Zaar provides a step-by-step recipe to create your very own edible vegetable arrangements. Ask the Decorator features online video of Chef Jason Hill demonstrating how to make edible vegetable arrangements. A small but sharp knife such as a paring knife is essential. Without it, you won't be able to make the sharp, precise cuts to craft interesting shapes. Many other kitchen gadgets can be found at gourmet cookware stores to help you peel and shape vegetables, such as knives with serrated blades to make zigzag patterns and more. Edible vegetable arrangements aren't too hard to make on your own, but if you're really nervous about making one, how about a simple arrangement of cut vegetables in appealing colors on a platter with dip in the center? Vegetables make great snacks for guests. They're healthy, and everyone's sure to find at least one they like. Create your own edible vegetable arrangements and get ready to bask in the applause as your guests cheer your creations.